Where was Tiktaalik roseae discovered? 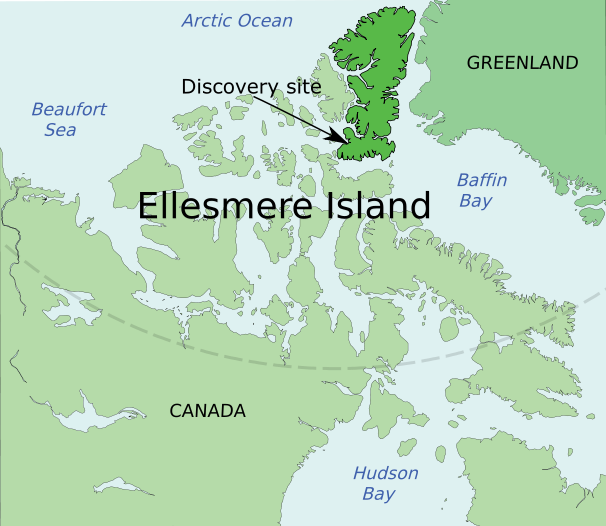 Tiktaalik roseae was discovered in sediments on Ellesmere Island in Nunavut, Artic Canada (Ahlberg and Clack, 2006). The sediments it was found in are from what is known as the Fram Formation, which is thought to be deposits of lowland streams (Murphy, 2005). When Tiktaalik was alive, it is thought that the Canadian Artic was part of a greater landmass (National Science Foundation, 2006). The deposits in which Tiktaalik was found are thought to be left by the stream systems on this landmass (National Science Foundation, 2006). Where did Tiktaalik roseae live? It is believed that Tiktaalik did not live completely on land, but instead inhabited the shallows and mudflats of freshwater floodplains (Downs et al., 2008). 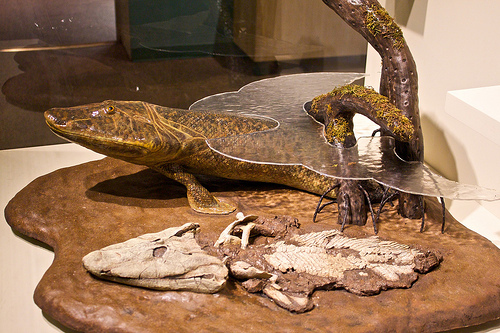 There are a couple of reasons that Tiktaalik may have been transitioning to a more terrestrial lifestyle, including to escape the larger predators of the deep water, since there were not many on land, and to hunt the abundance of fish and invertebrates in the shallows and along the shoreline (Owen, 2006, The University of Chicago, 2006). What kind of habitat did Tiktaalik need? Tiktaalik needed a very specialized habitat of shallow water or mudflats to live in. We can make this inference based on the adaptations of its body structure. Many of the body characteristics that are common to terrestrial animals, such as forelimbs capable of supporting weight, eyes positioned atop the head, and a neck that is able to move independently, began to appear in the morphology of Tiktaalik (Downs et al., 2008). These features present in Tiktaalik support the idea that Tiktaalik lived along the shore line in the shallows (Shubin et al., 2006). Tiktaalik had a wide range of features that made it very specialized to the area it lived in. One of these features is the pectoral fins. Because of the structure of the fin, it is very plausible that Tiktaalik used it fins as props in shallow water and as flippers to move it through the water (Owen, 2006). However, because the pectoral fins of Tiktaalik had a limited range of motion it would not be able to walk like some animals, such as amphibians (The University of Chicago, 2006). Another feature of Tiktaalik that made it specialized to the shallows and shorelines of where it lived are the larger ribs it had than its fish counterparts (Ahlberg and Clack, 2006). 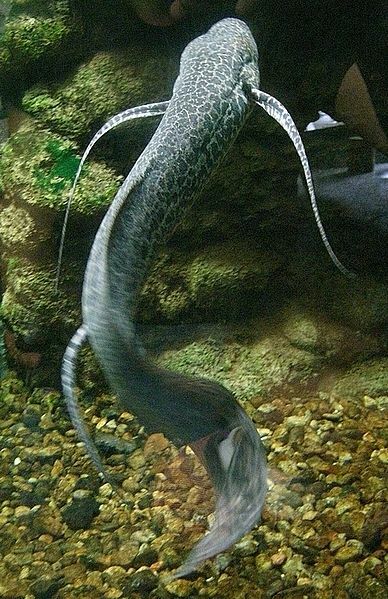 The large ribs of Tiktaalik amply supported the body of it, so that Tiktaalik was able to prop itself out of water (Owen, 2006, Ahlberg and Clack, 2006). For a fish, having large ribs is unnecessary because the water around it supports its body (Owen, 2006). The final features that Tiktaalik had that supported its existence in shallows and mudflats were its head and neck. 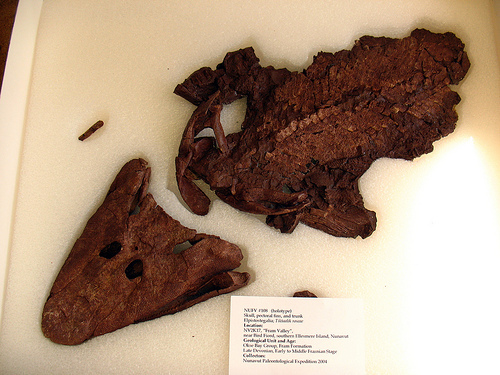 The head and shoulders of Tiktaalik were not connected so Tiktaalik had a neck that was capable of independent motion (The University of Chicago, 2006, Downs et al., 2008). Because Tiktaalik could move its head independently, it had the ability to raise its head above the water, making it easier for Tiktaalik to snap at its prey above water, which is more efficient than underwater (Owen, 2006). Read more about the body structure of Tiktaalik in Adaptations! Who else lives in Tiktaalik's habitat? Tiktaalik roseae lived during the Middle to Late Devonian Period, making Tiktaalik around 375 million years old. The Devonian Period is known as the Age of Fishes, because many fish species came to be, including placoderms, cartilaginous fish, lobefins, bony fishes, and ammonoids (National Geographic, 2013). 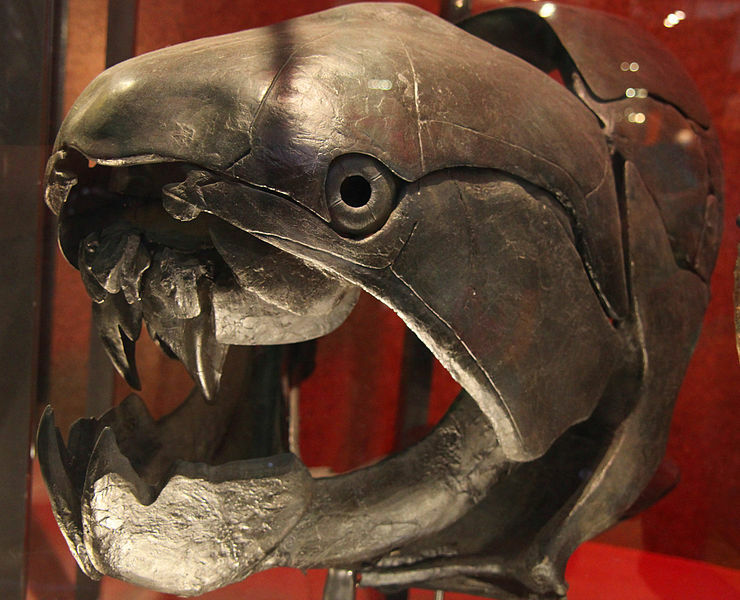 Other organisms that lived with Tiktaalik are brachiopods, trilobites, and lungfish (Kazlev, 2002). At the same time that fishes were coming about, plants were beginning to move onto land as well (National Geographic, 2013). 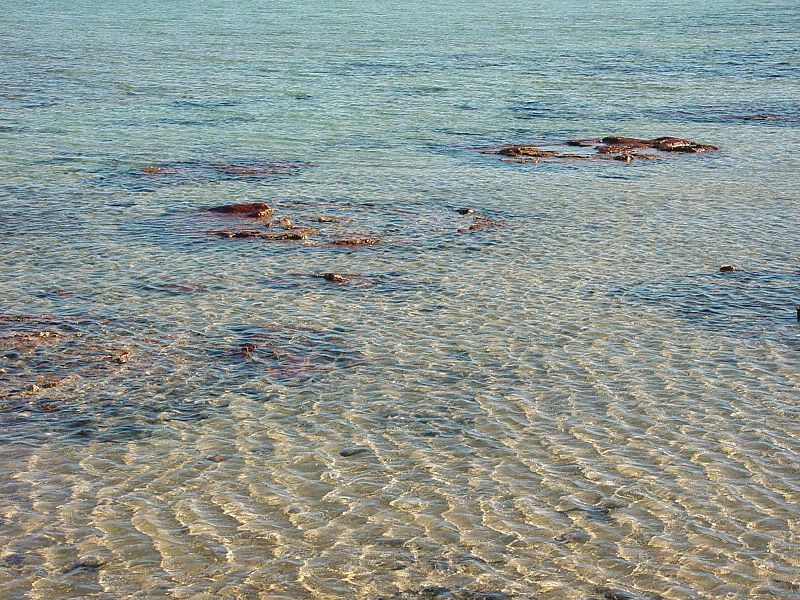 Many of these ancient organisms are related to many modern animals. Most of the fish that are alive today are a form of the bony fishes (National Geographic, 2013). Lobefins are some of the oldest ancestors of the amphibians, and the ammonoids are related to squids and octopuses (National Geographic, 2013).